I'm making the new theme of "Controversial Posts" to add to the blog, and this is the second in the theme. 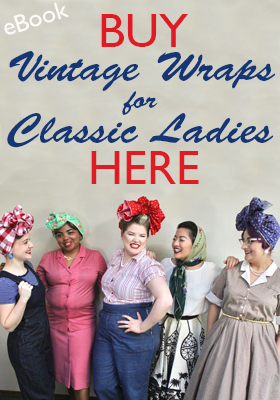 You can find the first one on altering vintage here. Most of us in the vintage world love a good novelty print and brooch, but there are times when vintage pieces make me cringe with their cultural and racial stereotyping. Obviously, this was acceptable in the 40s, 50s, and 60s (and even later), but they aren't so well received in most places of the world today. Does the piece highlight a different race or culture? Who? Are the scenes/people depicted in a way that enforces a stereotype? Is this stereotype derogatory, neutral, or positive? Could this stereotype be rooted in the stylized, artistic representation of a people/scene? Does this stylized representation seem to be trying to insult, or merely exaggerating a common feature? Does this piece, overall, give me a good impression of this people/culture? Does the piece strike me as whimsical or as making fun of someone? Knowing where I live and what I look like, what are the odds that someone would take offense at me wearing this? Is it worth the risk to me? Now below, I'm going to use this filter to analyze two vintage pieces, a novelty print and a jewelry set, to show you guys my line of thought on this. I think it's also good to note that we often think of "racist vintage" as pertaining only to black people or islanders, but in reality Asians, Caucasians, Middle Easterners, and Latinos are also depicted in vintage motifs. It's important to incorporate all the relationships between these races, not simply focusing on a black-white race view of things simply because it tends to be the "loudest" issue in society right now. You may or may not agree with my analyses of the following pieces, and that's perfectly alright because we all come from different world views. I'd love to hear your thoughts about it, or see how you would analyze any other vintage pieces! This is highlighting Hawaii and native Hawaiians. Absolutely. 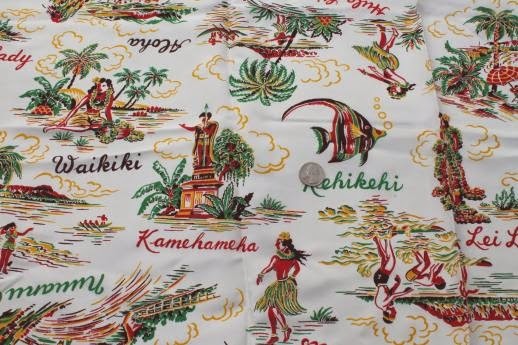 Hula skirts, leis, palm trees, surfers; the print is made of Hawaiian stereotypes! It reflects all the assumptions people have about the tangible parts of Hawaiian culture and show that Hawaii is a chill, fun place to be. Also, all the people are orange, reflecting a darker skin tone. It seems positive to me. Hawaiians proudly hula dance and surf still, and leis are still worn. They don't seem to be upset with these tangibles being connected to them in any way. Not to mention, who doesn't look at this and wishes they lived there? Mostly no, these stereotypes are found in the actual subject matter. Of course, Hawaiians are not the same color (and definitely not orange), but this seems to be a style and color palette choice. Definitely a good impression. It has a fun, tropical feel to it and makes me want to go to Hawaii. *Quick note: this is listed as blackamoor "Nubian" jewelry, but I have Nubian friends and this is NOT what they look like at all, not even remotely Nubian-looking. Yes, it's "blackamoor" jewelry, which I'm assuming is meant to portray Moors, or black Muslims. I would put this in the derogatory category. "Simple" is not a positive, and perpetual "jolliness" voids one of normal human emotion. The turban is a bit exaggerated, but I'd say it's neutral. Moors did wear turbans back in the day, so..... makes sense. It could be a little bit rooted in the style, perhaps with the colors chosen. The exaggerated facial features, however, are suggestive of imposed racist traits that aren't flattering and are meant to be demeaning. No, it seems to be making fun of them. They are cartoonish to the point of almost creepy. They don't seem like normal humans. It's not acceptable. There are a lot of black people in my area, and I would feel embarrassed to wear this out. (Even if there were absolutely no black people around... I would be embarrassed to wear this out.) It's not appropriate, and it's not worth the risk. It's a no-go for me. What are your thoughts on my analyses? Do you agree or disagree? 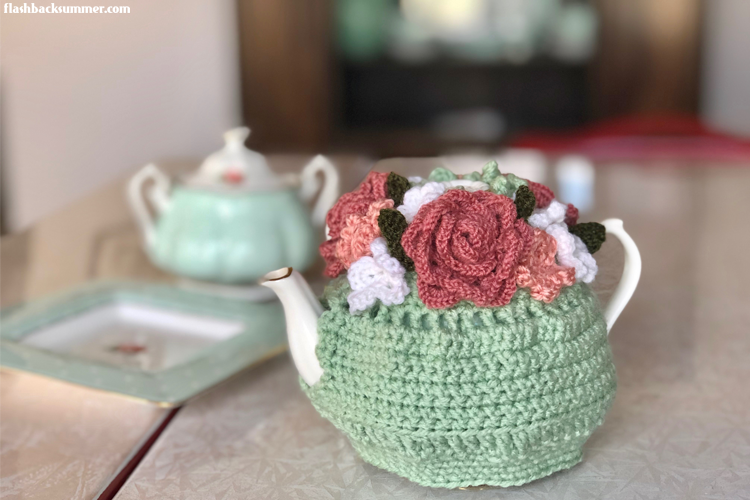 Do you have any pieces you would like to share or let the community discuss that you're unsure of? I love this series, and this post in particular is very topical. I agree with your opinions on these two pieces. I think there was recently a jewelry set that Topshop released that was based on that type of "blackamoor" jewelry you depicted. I think the vintage pieces, though certainly racist, are only *slightly* more understandable when you consider the time in which they were made. Obviously, racism is never acceptable, but I think new reproductions based on that type of vintage jewelry are way worse. People are reproducing this stuff?! I guess some of it (like this listing here: http://etsy.me/1rXEp8P) doesn't bother me because it legitimately just looks like an artistic representation of a person, just like how I have a brooch with a woman sitting in front of a mirror. It could still be sketch to some people, but I don't mind jewelry that is artistically portraying people of different races and ethnicities in a tasteful way. I agree with your analysis, but it would be interesting to know what an actual Hawaiian thinks of those images. I am of Native American descent (my great-grandmother was half Cherokee, but I know I don't look it), and I definitely look at depictions of Native peoples and cultures differently than if I didn't know my family history or the discrimination and crimes that were committed against native people in the past and present. I do wonder if I lived in Hawaii would I view it differently? Sometimes where we live/lived can change the way we look at representations of certain peoples or groups. For example, I live in rural East Tennessee and hate seeing the hillbilly representations of people from this area as being backwards, ignorant, and inbred, but can see it might seem different to someone living in New York City all their life. Yes, you're very right. I would love to see what a Hawaiian think so f this too! I'm also part Native American (my great-grandmother was a full-blooded Cherokee, and I also don't look it at all! I inherited the short, pasty German genes apparently!). I also lived in Egypt and Sudan before college, and this does play into what I think of Middle East-themed novelty prints. (Ones with mosques, men in turbans, even blackamoor jewelry, etc.) It's kind of obnoxious that oftentimes Middle East cultural images get mixed with India and southern African things, but I do understand that the Middle East wasn't really on the radar in the 40s and 50s. Same with tribal Africa. Few people had the capability to travel, TV didn't have shows on other cultures, and most immigrants were from Europe, some parts of Asia, or South America, and few of them lived in rural areas where most of the U.S. lived. It's understandable that there were misconceptions and stereotypes because people never got a chance to meet others of different cultures, and all they knew was hearsay, really. With that in mind, stereotypes about the Middle East or even tribal Africa (though those can get more sketch) don't usually bother me. There are ignorant people everywhere, and ignorance isn't always the fault of the ignorant person. I just choose to look at it as, "Hey, people in the 40s/50s were discovering there is a Middle East! They were realizing there are people that look different then them in dress, culture, etc., and they thought it was so great they put it in a fabric!" I agree with your analysis too. While certainly there have been negative situations in Hawaii with native people, the modern descendents of the native Hawaiians still wear grass skirts at times, Hawaiian dance is still performed, etc, and none of the things refer to negative stereotypes, but are part of a proud cultural heritage. On the other hand the jewelry does seem insulting. 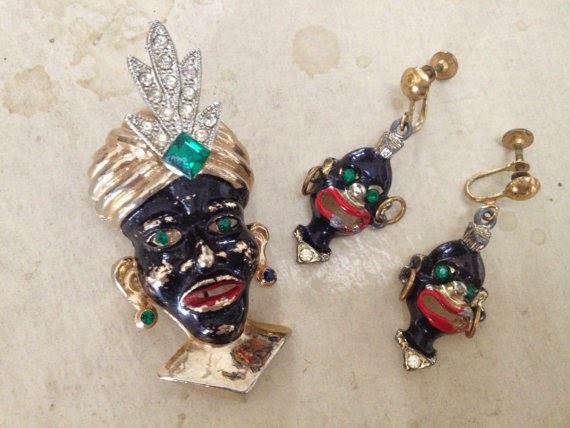 The earrings especially look like black clown faces, not realistic human beings. I think buying these would only be for those wanting to collect something historical, not for anyone to actually wear. Yes, I should hope they wouldn't wear it! Not to mention, racism aside, they're downright creepy! Hear, hear. I agree with your analysis :) What an interesting topic to cover on the blog - you smart you! Haha, thank you so much! I'm glad you find it interesting! I think it's fantastic that you're addressing something like this. I think that it's really important not to just gloss over what was going on in the time period that we have, at least sartorially, embraced. It's really easy to embrace the glamour and the style and everything, and not be as conscientious about the social issues that were going on at the time, like racism, sexism, etc. You raise some really good points about things to consider when looking at a vintage item. You're very right; it IS easy to embrace the glamour and not the downsides, and to even romanticize everything and make the past seem rosy and perfect. I'm glad this has been interesting to you! I LOVE this post! And I LOVE this series you are doing! I find your in-depth takes and conversations about vintage to be so refreshing and wonderful. Like your alteration post prior, I too face this sort of issue often. I adore Native American prints, including cartoon-ish versions. So this "test" that you offer is very ingenious! Good, I'm glad you find these enjoyable! I hope this helps with your favorite prints, too! I also love Native American prints, so I get that. In those cases, I claim my Cherokee heritage (whose genes were obviously not passed down to my short, pasty self). Yeah, I see what you mean; it was the way things were. And I do think these times are too PC, but in the world as it is right now, it seems you'd probably get a little more leeway as a Latina on such issues than, say, a white male would. Which is a great thing that you should enjoy! :) Weird how culture has swung the other way, from racism to today, where the majority tend to avoid talking about minority races at all for fear of not being PC. Where's the happy medium? I really like this post, Emilieigh. The jewelry in the second example reminds me of the blackface used in American history by white people. They'd paint their skin black and their lips red in minstrel shows to make fun of black people. Definitely not appropriate. More people should exercise this kind of thoughtfulness when they are making the decision to wear clothing. Thanks, Mary! I'm glad you've enjoyed it. 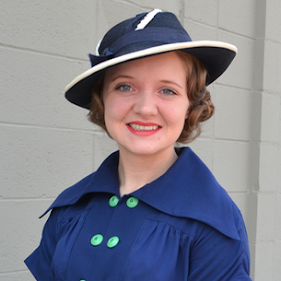 There are lot of "iffy" things that pop up in the vintage world, and rather than pounce on people who wear it and attack them right off the bat, I think it should be discussed so we can all learn together.